Just recently, myself, fellow Ferrumblogger and worm-expert Dr Gawain McColl, with friends of the blog Dr Martin de Jonge (a physicist from the Australian Synchrotron) and Dr Elizabeth New from Sydney University published a tutorial review in the famed chemistry journal, Chemical Society Reviews (you can access the paper for free here). This paper set out to describe to the undergraduate chemistry student and above just what’s out there when it comes to imaging metals in biology at the level of the cell. In what turned out to be one of the more enjoyable papers to write, this review covers a range of topics that is designed to help fellow chemists and biologists alike appreciate just how much better science is when we all work together. Read more after the jump, and credit to our friend Jonas Marnell at Ethix Design for the funky artwork that appeared on the journal’s back cover. The crux of our argument was that no one analytical technique can provide all the information you could possibly want regarding metals in a biological system. Take the picture to the right here. 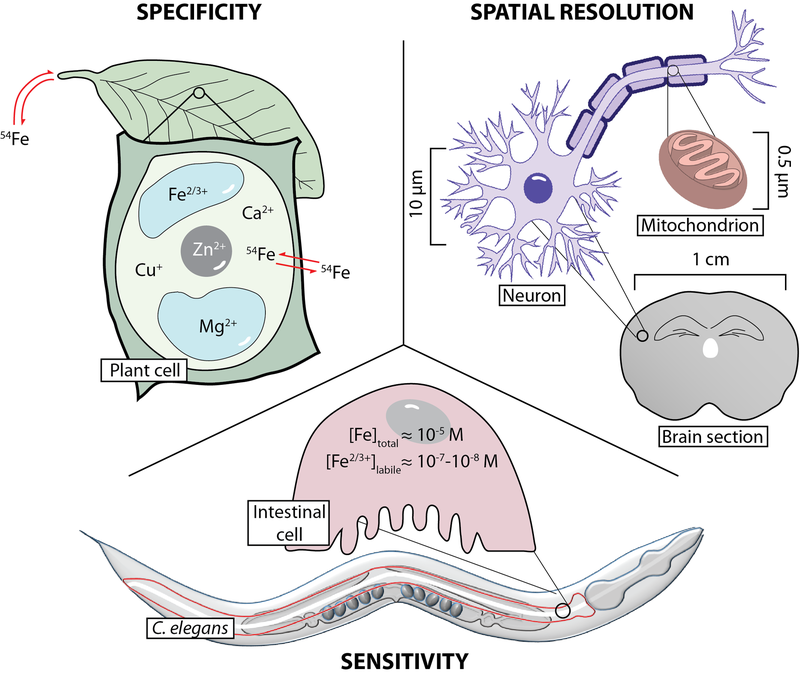 We broke imaging ‘needs’ into three categories: specificity, spatial resolution and sensitivity. Specificity refers to being able to confidently identify the chemical state of a certain metal, as in, is it an unbound ion, bound to a certain protein, or even an effect of an external treatment. Spatial resolution has long been something all imaging scientists have considered the Holy Grail-the more pixels, the more information, right? Well, not always-there’s always some kind of tradeoff. High resolution images can take a long time to make (imaging metals isn’t quite like buying an expensive camera that makes a satisfying ‘click’ noise and writes it to a memory card), and often needs machines with a pretty hefty price tag. The Australian Synchrotron itself has an average annual power bill of around $6 million. Of course, it does do a few more things than imaging metals. Finally, sensitivity is all important for being able to detect those tiny amounts of metals in what are becoming smaller and smaller samples. Our review went through a whole range of techniques, each covering the expertise of the authors. Me, I talked a lot about mass spectrometry, and how we can use the newest technologies to turn what used to be beige boxes used in the mining industry into a key component for measuring all aspects of metal metabolism, not just the metals themselves. This follows on from previous work we’ve talked about here using tagged antibodies (like here and here), and building on the AMAZING work of Dr Charlotte Giesen, formally of ETH Zurich and now at Roche, who published one of the most envy-inducing papers ever last year in Nature Methods. Liz, who is one of Australia’s (actually, scratch that, the world’s) best young inorganic chemists, builds incredibly elegant chemical probes that get into a cell and, to put it simply, change colour when certain chemical environments, such as metal oxidation states, change. We’ll be talking about some of Liz’s exciting recent papers in the near future. Martin, who specialises in tomography, or three-dimensional modelling of metals in biological systems, wrote about new advances in synchrotron (you know, just those multi-million dollar particle accelerators that speed electrons up to near the speed of light, the things that number only around 30 or so in the world, and one of which happens to be here in Melbourne, Australia) technology, using a method called X-ray fluorescence microscopy. This pretty cutting-edge branch of physics that meets biology and chemistry somewhere in the middle uses those speedy electrons to make hard X-ray beams (enough to cause some serious damage if you don’t get out of the room in time…), which when they hit a sample the cause the emission of unique fluorescence that we can relate to a specific element. Using some pretty high-end computing, we can rebuild these emission spectra into some nifty three-dimensional reconstructions of small organisms, like C. elegans (a in the figure on the left) and zebrafish embryos (b; courtesy of the Royal Society of Chemistry). Scaling up, we can even use mass spectrometry to map metals in the whole mouse brain (c; courtesy of the American Chemical Society from my paper here), showing there is some complementarity between imaging techniques. The goal is to start brining these techniques together in more comprehensive experiment al designs. By assembling the team of myself, Gav, Liz and Martin, we represent two chemists, a geneticist and a physicist. Science can only move forward when people from multiple disciplines work together to make discoveries happen faster. As Liz put it so well in the paper when talking about fluorescent sensors (though I think this can apply to all chemists trying to break into biology: “Despite the promise of metal-responsive probes, there tends to be a disconnect between the chemists who develop these sensors and the metal biologists who apply them. Detailed biological studies have tended to use probes developed decades ago, which certainly do not represent contemporary advances fluorescent sensor chemistry. In order to harness the potential of the next- generation probes being developed, it is essential that there is more communication between those who make and those who use these tools.” Images like the one to the right here, where fluorescence microscopy of green fluorescent protein-labelled cells in C. elegans were used to correlate with calcium and manganese concentrations in the intestine are only a demonstration of the power combining what we call ‘multimodal’ imaging can achieve. Watch this space for more, as unifying imaging in biology becomes more and more the research focus of our respective research groups. You had me at iron on fire.